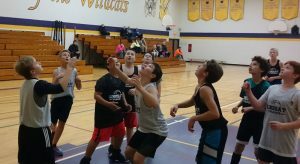 Lindsay Wildcats offer house league basketball for boys and girls in grades 3 to 8. A fun filled program focusing on skill development for the beginner and experienced player. Practice and game each night, with equal player participation. Program is run by Ontario Basketball Certified coaches and high school student coaches from our OBA rep teams. House League season for Fall 2018 will be starting Thursday, September 27th, and will run each Thursday evening for 10 weeks. Keep checking back for schedules, and game results. You can enroll your child in House League using our new Online Registration!. Please visit our registration page for more details. Gym times are scheduled to start at 6 pm and sessions run 1 hour 30 minutes. Some divisions will have a staggered start. Boys and girls play in separate gyms. Each player will receive a reversible basketball shirt and parents are encouraged to bring their child with them, when registering, to get correct sizing. 10 week program is $160 per participant. For maps and addresses, visit our Locations page. Girls in grades 3-6 St. Thomas Aquinas Catholic S. S.